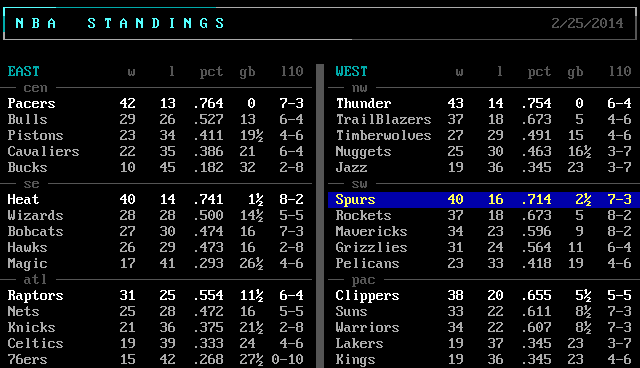 A mockup showing how the NBA standings might look in Sports Stats. Last year I was studying BBS doors. This year I’ve started writing some! “Jewel Mountain,” a game I’m making with my daughter. Progress has been slow because we still haven’t worked out exactly what the game mechanic should be. “Sports Stats,” an informational door that will give live standings and scores. We are St. Louis Cardinals and San Antonio Spurs fans at my house, and my daughter always checks results from the previous night in the morning newspaper. So I figured why not bring that to our little BBS? I have made good progress on Sports Stats, and I hope it might become a door I can release for other sysops who might want it. Jewel Mountain will likely remain just our private little experiment. But if somehow we manage to make something playable, then we’ll release it too. My daughter dreams of people sending in registrations like the BBS days of yore, but I had to bring her back down to earth and tell her it’s highly unlikely. I’ve also been more of a sysop lately, customizing the BBS. I have been created more ANSIs for different occasions: Valentine’s Day, etc. I made one of Kirk and Spock looking at the Guardian of Forever to use with the login matrix mod from Digital Distortion. Of course I make liberal use of Photoshop, then ANSIrez to convert an image to ANSI, and PabloDraw to clean and refine the ANSI. The release of old issues of “Door World Magazine” reformatted for the web. And more. But there a lot of pots on the stove. I need to get cooking!